Compare E.ON energy gas, electricity and dual fuel tariffs. FreePriceCompare finds the best deals from more than 40 companies. No one compares more than us! Please note by signing up to this tariff customer agrees to be contacted by E.ON for the installation of a Smart Meter and, where eligible, have one installed for each fuel they supply. You can stay on this tariff if E.ON aren’t able to fit a Smart Meter.Other information associated with plan. This tariff comes with a clean bolt on for £2 per month (£24 for the year) which matches your tariff with 100% renewable electricity and also for dual fuel customers 100% carbon offset gas. Please note by signing up to this tariff customer agrees to be contacted by E.ON for the installation of a Smart Meter and, where eligible, have one installed for each fuel they supply. They can stay on this tariff if E.ON aren’t able to fit a Smart Meter. Please note by signing up to this tariff customer agrees to be contacted by E.ON for the installation of a Smart Meter and, where eligible, have one installed for each fuel they supply. You can stay on this tariff if E.ON aren’t able to fit a Smart Meter. Other information associated with plan. This tariff comes with a clean bolt on for £2 per month (£24 for the year) which matches your tariff with 100% renewable electricity and also for dual fuel customers 100% carbon offset gas. If customer choses to switch to another E.ON tariff or move house, no exit fee will apply. This tariff comes with a clean bolt on for £2 per month (£24 for the year) which matches their tariff with 100% renewable electricity and also for dual fuel customers 100% carbon offset gas. Please note by signing up to this tariff customer agrees to be contacted by E.ON for the installation of a Smart Meter and, where eligible, have one installed for each fuel they supply. They can stay on this tariff if E.ON aren’t able to fit a Smart Meter. Please note by signing up to this tariff customer agrees to be contacted by E.ON for the installation of a Smart Meter and, where eligible, have one installed for each fuel they supply. You can stay on this tariff if E.ON aren’t able to fit a Smart Meter.Other information associated with plan. Please note by signing up to this tariff customer agrees to be contacted by E.ON for the installation of a Smart Meter and, where eligible, have one installed for each fuel they supply. Customer can stay on this tariff if E.ON aren’t able to fit a Smart Meter. E.ON’s Monthly Direct Debit customers will receive a direct debit statement once every quarter, unless a change to their direct debit amount is required. E.ON will review customer’s account twice a year and if payment needs to change they will give at least 10 working days notice. Please note by signing up to this tariff customers agree to be contacted by E.ON for the installation of a Smart Meter and, where eligible, have one installed for each fuel they supply. You can stay on this tariff if E.ON aren’t able to fit a Smart Meter. E.ON’s Monthly Direct Debit customers will receive a direct debit statement once every quarter, unless a change to their direct debit amount is required. E.ON will review customer’s account twice a year and if payment needs to change they will give at least 10 working days notice.Please note by signing up to this tariff customers agree to be contacted by E.ON for the installation of a Smart Meter and, where eligible, have one installed for each fuel they supply. You can stay on this tariff if E.ON aren’t able to fit a Smart Meter. E.ON’s Monthly Direct Debit customers will receive a direct debit statement once every quarter, unless a change to their direct debit amount is required. E.ON will review customer’s account twice a year and if payment needs to change they will give at least 10 working days notice.. 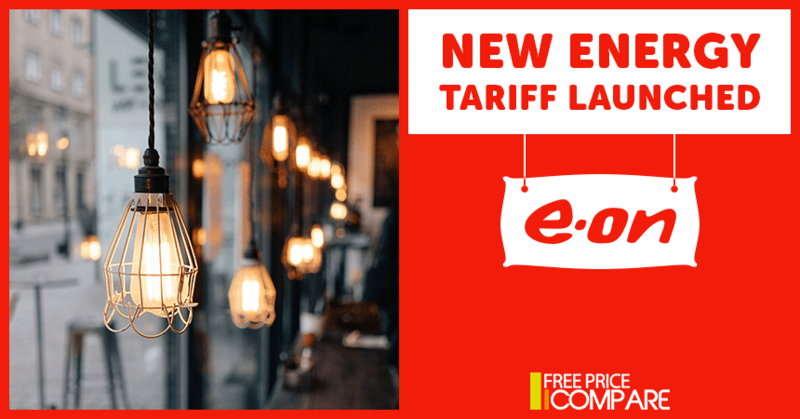 If customer choses to switch to another E.ON tariff or move house, no exit fee will apply. In order for customer to receive paperless billing customer will need to provide a valid email address. E.ON’s Monthly Direct Debit customers will receive a direct debit statement once every quarter, unless a change to their direct debit amount is required. E.ON will review customer’s account twice a year and if payment needs to change they will give at least 10 working days notice. By signing up to this tariff customers must agree to be contacted by E.ON for the installation of a Smart Meter and, where eligible, have one installed for each fuel they supply. They can stay on this tariff if E.ON aren’t able to fit a Smart Meter. Please note customers signing up to this tariff will be contacted by E.ON for the installation of a Smart Meter. If customers already have a smart meter installed, E.ON may still contact to upgrade the meter. Customers can stay on this tariff if E.ON aren’t able to fit a Smart Meter. E.ON will match 100% of your electricity with Renewable Energy Guarantees of Origin (REGOs) and Green Gas Certificates (GGCs). We have just gone live with E.ON- E.ON Smart Saver 1 Year v3 and removed their E.ON Go Online 1 Year v11 tariff. New tariff is available for sale via all the channels. E.ON’s Monthly Direct Debit customers will receive a direct debit statement once every quarter, unless a change to their direct debit amount is required. E.ON will review your account twice a year and if your payment needs to change they will give you at least 10 working days notice. E.ON Smart Saver 1 Year v3 is a discounted tariff and prices are fixed for 12 months beginning on the day E.ON starts supplying your energy. There is a cancellation fee of £30 per fuel if you switch away before the end of the fixed price period. The estimated savings figure on the results table assumes tariff rates and discounts remain the same for a year. However, around 6 weeks before the end of the fixed price period E.ON may offer you a follow on fixed tariff. If you don’t accept this offer you will transfer to their standard variable prices at the end of this tariff, which may be more expensive than E.ON Smart Saver 1 Year v3. Share the post "New Energy Tariffs Launched By E.ON Energy"